I can haz sevral plz? …Is it possible to give negative stars? Yuck. The fact that someone had this idea, presented it to a group of people, convinced them that it was a good idea, got them to produce it and make this poster, is quite sweet. By sweet you mean disturbing, right? By sweet I mean batshit insane. But that was close enough. Looks great to me… same as a beef manhattan. 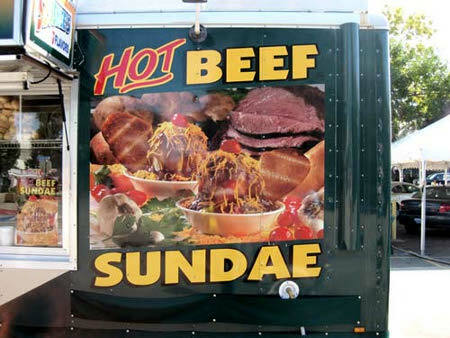 Hot roast beef on the bottom, mashed potato in the shape of a scoop of ice cream, gravy, shredded cheese, cherry tomato on top… Yummmm!